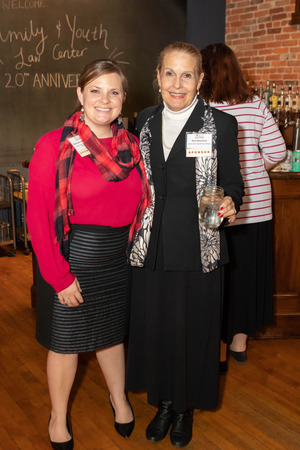 What a nice time everyone had at FYLaw’s 20th anniversary celebration on Thursday, October 18th. 20 years. That’s four Executive Directors and one Interim Director. 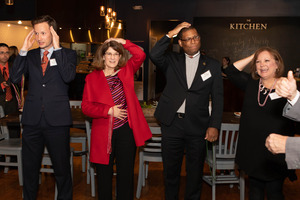 Five Capital University Law School Deans. Five Capital University Presidents and three Interim Presidents. Four US Presidents. Five Ohio Governors. 684 episodes of Sesame Street. 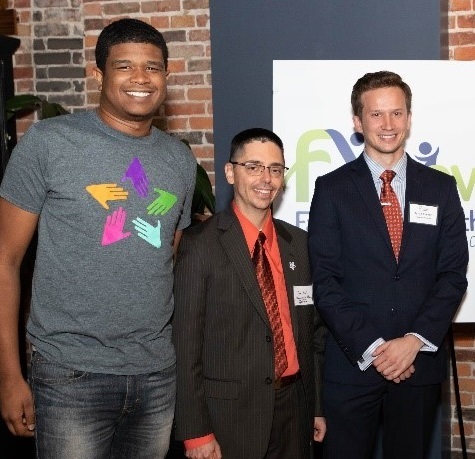 FYLaw’s origin story includes an off-hand comment from the late Dave Thomas, an adopted child, the founder of Wendy’s, and the push behind many initiatives to encourage adoption. In 1997, the University’s President and the Law School’s Dean approached Mr. Thomas to ask if he would consider a financial gift toward renovating the future house of the law school at 303 East Broad Street, renovations that would include the school being named in his honor. Reportedly, he responded, “Why would I do that? Lawyers have made things more difficult!” But he countered with a proposal to establish a center to promote adoption so that “children’s pajamas were in the drawers of permanent homes.” That got people thinking, and in February, 1998, our Center opened its doors with a $250,000 gift from the Dave Thomas Foundation for Adoption. 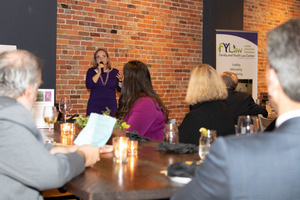 The 20th celebration brought back many people who made FYLaw what it has become today. 50-some guests enjoyed each other’s company for two hours- catching up, laughing, and talking about the origins of FYLaw. 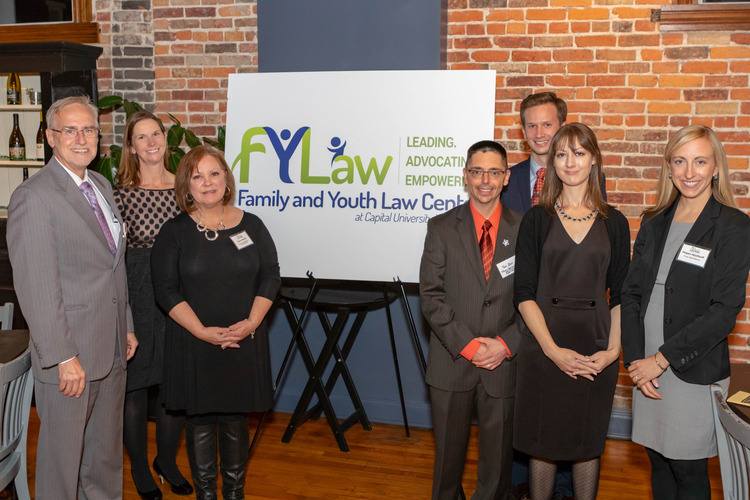 Executive Director, Douglas Althauser, welcomed the crowd, and introduced Capital University President Beth Paul and Law School Dean Rachel Janutis who welcomed guests and talked about the contributions FYLaw makes in the community. 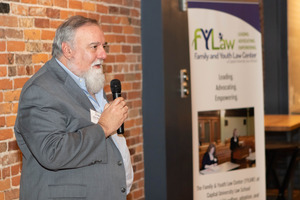 Kent Markus, the first Director of the Center (back when it was named the Dave Thomas Center for Adoption Law, and then the National Center for Adoption Law & Policy) delivered remarks about the families-by-any-means philosophy that started and maintained the Center. 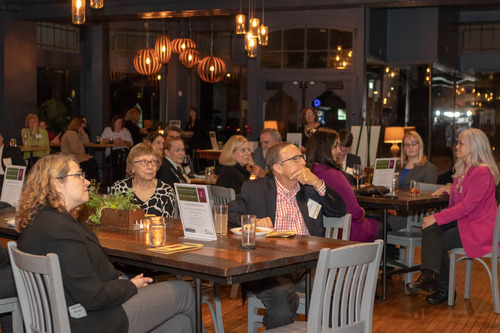 Retired Ohio Supreme Court Justice Evelyn Lundberg Stratton spoke about how the community recognized the need for an organization that would advocate for adoptions, and the influence this had, such as when the Supreme Court formalized rules for Ohio courts that expedite appeals and hearings related to adoptions. Melinda Haggerty, Senior Vice President and General Counsel with the Dave Thomas Foundation for Adoption spoke on the dedication of Dave Thomas, himself, and the Foundation’s ongoing commitment to helping children find forever-homes; a dedication which has included supporting FYLaw through two decades. 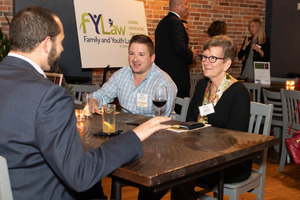 Capital University President Beth Paul, and former FYLaw Intern Kevin Serrott talk with a FYLaw supporter. Thank you to those who were able to join us at the celebration. Let’s look forward to the next 20 years! Proceeds will support initiatives of the Family and Youth Law Center (FYLaw). If you have any questions contact Jackie Martin at 614.236.7239 or at jmartin@law.capital.edu. © 2019 · Family & Youth Law Center. All Rights Reserved.